Here are five things you can do to help the honeybee. There are many flowers that bees really like and we call these ‘bee friendly flowers.’ Bees need flowers to survive. Flowers produce pollen and nectar. The bees collect the pollen to eat for themselves and to feed to their babies back home. Pollen is the bees source of protein, just like you and I need protein to grow healthy and strong, bees need protein as well. Nectar is the bees carbohydrates. Carbohydrates give the bees energy to do all of their many jobs. Honeybees also use the nectar to make honey! You can help provide the bees with food by planting flowers in pots or in your yard for the bees to come and collect pollen and nectar! 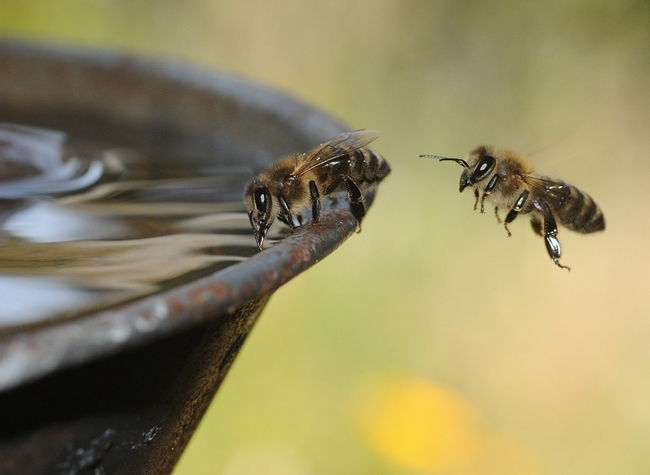 Just like most creatures on earth, bees need water. Water helps to keep the bees hydrated. You can help the bees by creating a little spot for them to come and get clean water to drink. Pour water in a small bowl and add rocks or sticks to the water so there is a place for the bees to land so they don’t drown. Providing the bees with water is a great way to help! You can support beekeepers by buying local honey. Beekeepers work hard to keep their bees alive and healthy so that they can pollinate our food for us. Many times when the bees make honey, the beekeeper will sell that honey to make money to keep taking care of his/her bees. So you can help the honeybee by supporting and buying honey from a beekeeper in your area! Yes, you can be a beekeeper! Beekeepers are all different ages. So whether you are a young kid or a grown adult, you can start keeping bees. The first step to being a good beekeeper is learning as much as you can about honeybees. There are classes and books that will teach you all you need to know to start your own beehive. Starting your own bee hive is a very fun way to help honeybees! Lastly you can teach your friends and family what you know about honeybees. You can teach them how important they are to our food supply and to our environment. You and your friends can plant flowers together, or make bee watering spots, or even enjoy eating honey snacks together all while helping the honeybee thrive. Honeybees are amazing creatures and they need your help! As the 2019 American Honey Queen and Princess, we educate people about honey and beekeeping. This page is especially for elementary school students to learn more about honeybees! Watch more videos on YouTube!